You often hear people refer to their pets as their “fur family” or to their dogs as their “babies.” To someone who has not owned a dog, this comparison might seem like a bit of a stretch, but in reality, having a dog can be a serious, full-time job. From grooming to feeding, and exercise to trips to the vet, getting a dog is not always a walk in the park. Of course having a dog in your life also brings immense joy and companionship; however, properly taking care of your pooch should be a top priority as well. Ensuring that you are providing your dog with an adequate amount of attention and care is essential to being a loving, responsible pet owner. Even though dogs require a substantial amount of attention and effort, there are certain breeds that require less maintenance than others. 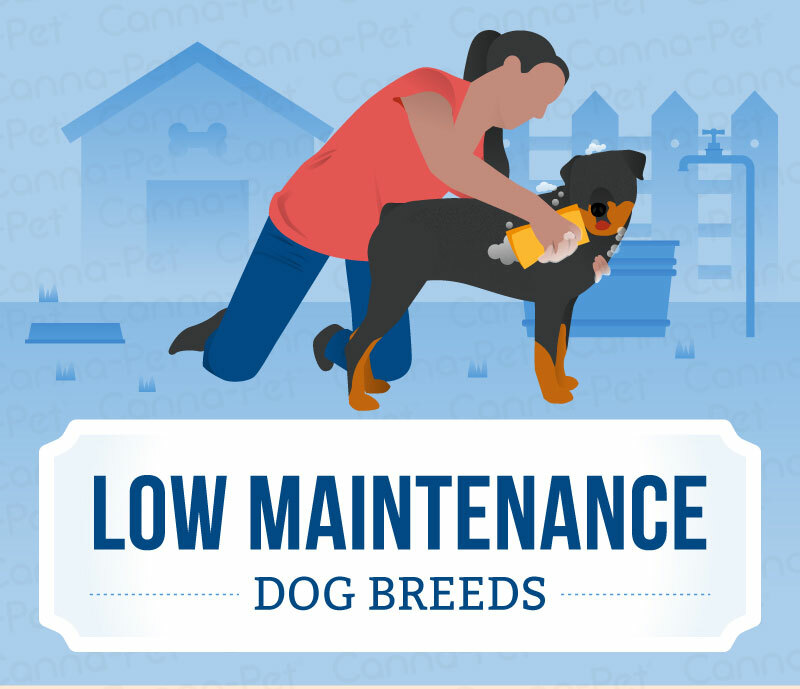 If you are dying for a fur family of your own, but are concerned about the time requirement, consider getting one of these low maintenance dog breeds. 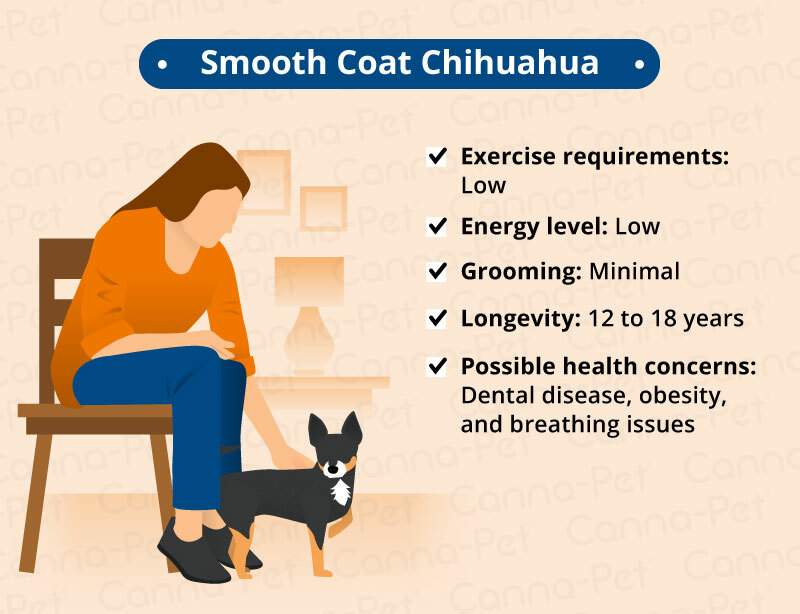 One of the lowest maintenance pups out there is the Smooth Coat Chihuahua, making them a great fit for those who are concerned about the amount of time they can dedicate to canine maintenance. In terms of energy, Chihuahuas like to play, but after playtime is over, they love burrowing in a cozy bed or basking in the sun. These pups are relatively low on the energy scale, making it easy to keep up with their exercise routine. Additionally, because they are small dogs, you can easily toss a ball for them in the living room while you are multitasking in the house. Grooming a Smooth Coat Chihuahua is a quick and easy task as well. It is important to note that there are both smooth coat (or short-haired) Chihuahuas and long-haired Chihuahuas. The longhaired version of the breed will require more maintenance in terms of grooming. Brushing your Chihuahua every few days should be an adequate amount of grooming. In the summer months when your pup starts to shed, you should increase the amount of brushing to help eliminate shedding. Even when you increase the amount of brushing, grooming a small dog breed is not a daunting task. Another reason that the Chihuahua’s grooming routine is low maintenance is because of the shape of their ears. Chihuahuas have perky, pointy ears as opposed to floppy ears, which makes them less prone to infections. While you will still want to take your Chihuahua in to the groomers to have his or her nails trimmed, teeth brushed, bathed, this breed is low on the maintenance scale. Finally, Chihuahuas typically live long lives, ranging anywhere from 12-18 years old. However, like many pure bred small dogs, they can be prone to health issues. Their small mouths can lead to dental issues if not properly cared for. They are also often overfed—leading to obesity. They are also prone to breathing difficulties. Many Chihuahuas will live their whole lives without experiencing health issues, but health care and trips to the vet are another area of maintenance to be aware of when picking a pooch. As a side-note, Chihuahuas can often be one-person dogs, and are not always the friendliest towards other people. They can be trained to be social, but make sure you think about the dog’s personality in conjunction with the amount of maintenance they require. One of the best low maintenance dog breeds is the Italian Greyhound. Italian Greyhounds are the smallest of the sight-hounds and are a great fit for someone looking for an easy-to-care-for companion. Italian Greyhounds enjoy a moderate amount of play, but for the most part they are content lounging on the couch, ideally in their owner’s lap. If you can dedicate time for a quick walk and a game of fetch, you will have a happy hound on your hands. Italian Greyhounds have mild to moderate energy levels, but they are sensitive dogs that do not always do well with large groups or children. If you are looking for a companion dog, a Greyhound might be the perfect pup for you. When it comes to grooming an Italian Greyhound, this breed is amongst the easiest dogs to care for. They have extremely thin coats, leading to essentially no shedding. Because their coats are so thin, they rarely need a bath. Over-bathing an Italian Greyhound can dry out their skin, so wiping them with a damp towel is a safe alternative. Just like with all dogs, they should have their nails trimmed and teeth brushed routinely, but in terms of their coat, Italian Greyhounds are very easy to care for. Italian Greyhounds are very healthy dogs. They have low fat content, which is good for their health, but you may need to be sensitive to their temperature during the colder months. 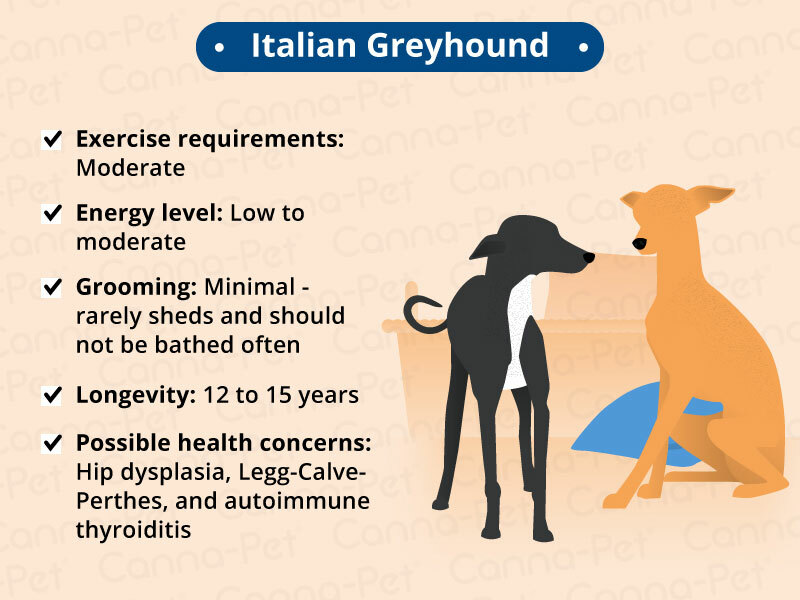 Like with all dogs, they are susceptible to illnesses and diseases such as hip dysplasia, Legg-Calve-Perthes and autoimmune thyroiditis, but overall, Italian Greyhounds are happy, healthy companion dogs. Another wonderful dog breed that is low maintenance is the French Bulldog. These dogs are known for their friendly, adaptable, and intelligent dispositions, making them one of the most popular dog breeds today. The French Bulldog loves to play, but for the most part is very low-energy. This low-energy lifestyle makes the French Bulldog easy to care for in terms of maintenance. If you can commit to taking your Frenchie out on walks and playing with him or her once a day, your pup will be content lounging for the remainder of the day. Frenchies are also low maintenance when it comes to grooming. They have short coats and only require occasional brushing and grooming. It is important to check their bat-like ears for infections and ensure their nails do not become overgrown. However, aside from regular grooming that all dogs must have, they are easy to care for. One area where the French Bulldog falls short is health. These loveable creatures remain popular due to their wonderful personalities, but they are more likely to encounter health issues than some other breeds. Since Frenchies are a short-faced dwarf breed, they often suffer from breathing issues. Their short noses and pinched nostrils can lead to inadequate breathing, causing stress and anxiety during heat and exercise. Other common health issues include abnormal vertebrae and/ or premature degeneration due to their stocky builds. Try selecting a veterinarian that treats other short-faced dogs so that he or she is experienced in monitoring the health complications that these personable pups sometimes face. Despite their towering size, Great Danes are comparatively low maintenance pooches. Their size can actually be a benefit, making them one of the few low maintenance outdoor dog breeds, as opposed to small dogs that may need to be kept indoors for safety reasons. Great Danes enjoy a moderate amount of exercise, and their friendly, dependable dispositions make them a great dog for a variety of people to play with. Great Danes should be played with and walked a few times everyday, but once their walk is in, they love being couch potatoes. If you can dedicate time to routine walks and playtime, you will spend the rest of your day with a happy, mellow mutt. Great Danes have short coats and do not require any extra grooming attention. They should be brushed and bathed occasionally, but other than that are very low maintenance. You should ensure their nails are kept short and teeth are kept clean, but that is the case with all dogs. Even though Great Danes are large in size, they require a small amount of maintenance. Generally speaking, Great Danes are a healthy breed. They are susceptible to illness and disease like all other dogs, but usually live healthy lives. The average Great Dane can live anywhere from eight to ten years, with some only living six or seven years. Due to their large size, their bodies simply cannot maintain a long lifespan. This is not due to a specific health complication, but due to their size. However, an overweight Great Dane is much more likely to pass away at a young age as opposed to a lean dog. 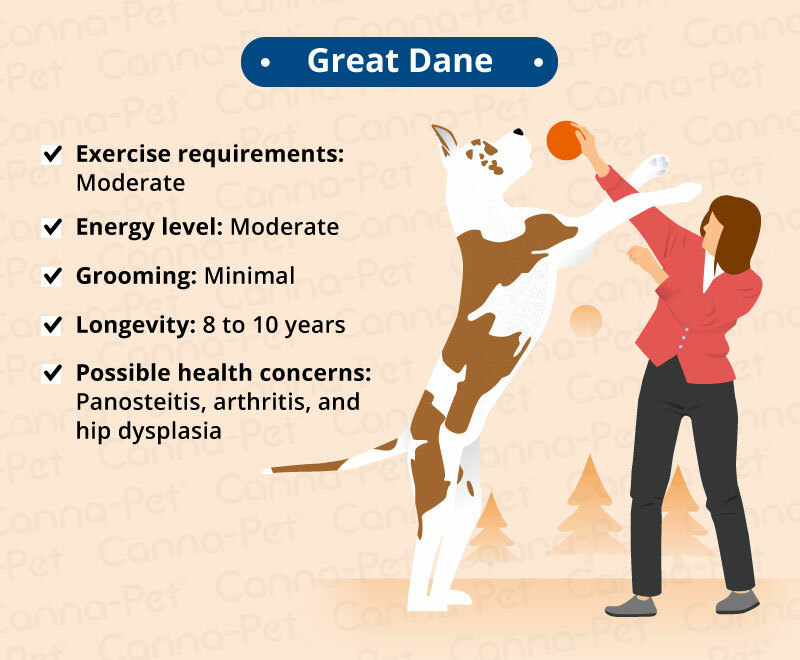 Another health complication Great Danes may face due to their size is Panosteitis, which is a mild bone disorder that occurs during the Great Dane’s rapid growth. Pugs are known for being loving, quirky, and easy-to-care-for, making them a popular breed. Due to their small size, Pugs can do well being primarily indoor, but do love exercise. While their energy levels are low to moderate, they are curious dogs that love to explore. Pugs should get plenty of long walks to keep them healthy and to satisfy their curious nature. Dedicating a few brisk, long walks to your Pug will keep him or her happy and healthy. In addition to their low maintenance exercise routine, Pugs have short hair and are easy to groom. Weekly brushing and an occasional bath is all that a Pug needs to keep his or her coat healthy. Be on the lookout for overgrown nails or buildup of wax in the ears, but other than regular maintenance, Pugs do not require extra grooming. Pugs are also healthy pups, leading to fewer trips to the vet. However, there are a few health complications that pugs may be more susceptible to including canine skin disorders caused by bacteria or hormone imbalances. Keep an eye on your Pug’s coat to ensure that his or her skin is not irritated. Additionally, Pugs’ short noses can lead to breathing problems such as Stenotic Nares. Consult a veterinarian to ensure that your Pug is not suffering from breathing complications. A larger dog that is relatively low maintenance is the loving and loyal Rottweiler. These dogs are a large enough to be on their own outside, but not so big that they cannot curl up on the couch with you. Rottweilers require a moderate amount of exercise. They definitely are not couch potatoes, but a morning run, a few trips outside throughout the day, and long evening walk should be adequate. Rottweilers love spending time with people, so if you are looking for a walking buddy, a Rottweiler may be the dog for you. Rottweilers are medium sized and have short coats, making them low maintenance in terms of grooming. With brushing every few days and an occasional bath, you should not have to do any extra grooming other than what is required for every dog. As a breed, Rottweilers are healthy dogs. They can develop common diseases such as hip and elbow dysplasia, eye problems, and other genetically inherited diseases. If purchasing your Rottweiler from a breeder, check your pup’s health history to be aware of potential diseases before they form. However, generally speaking, Rottweilers should be low maintenance in terms of health and should live long, healthy lives. Beagles are a favorite amongst dog breeds for both their outgoing, happy dispositions and their low maintenance upkeep. The one factor about Beagles that does not fall neatly into the low maintenance category is their energy. Although Beagles do not have an extremely high level of energy, they do fall into the moderate category. Beagles were originally bred as hunting dogs, and therefore they love to stretch their legs and use their noses. Beagles thrive in areas with a securely fenced-in backyard where they can safely run around and play, coupled by plenty of long walks. If you are not worried about providing your four-legged friend with enough exercise, a Beagle is a wonderful dog to consider. Beagles are compact canines, so it is easy to get them in the car to go to the dog park or on a hike. Grooming Beagles is a simple task. They have short to medium coats, which only require standard brushing. Brushing your Beagle regularly with a shedding tool and hand brush will help avoid excess shedding. Since Beagles have floppy ears, you should check under the ears occasionally for any unusual smells or appearance, which may be an indication of an ear infection. However, in terms of overall grooming, Beagles are an easy to care for breed. Generally speaking, Beagles are lovable, healthy dogs, which contributes to them being low maintenance. However, just like with all animals, they are still at risk for a variety of health concerns that will require trips to the vet. Beagles are often susceptible to hip dysplasia and hypothyroidism. Beagles are an overall healthy breed, and your breeder should be able to provide you with thorough information about your dog’s health history. If you are looking for a dog that gets along with people and other pets and is low maintenance, a Beagle might be the right fit for you.